I knew it would happen eventually. I was prepared for the moment when Ryan, my great eater who would pretty much gulp down whatever was set in front of him, decided that he wanted to be more selective about what he ate. Pickiness may be a right of passage for kids, but it doesn’t have to be the end all be all for nutrition and healthy eating. 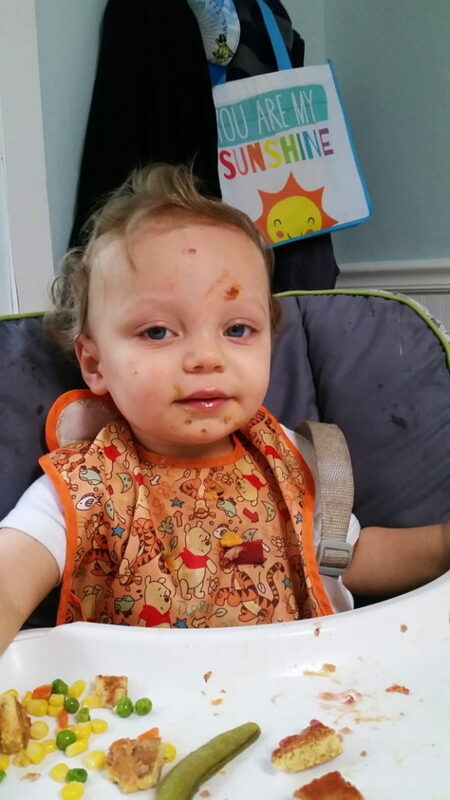 Although we are far, far from out of the woods on the food fights, I’ve started to accrue some tips and tricks for what to do when your good eater starts getting picky. Below are some of my favorites that seem to work really well for our family, and I hope they’ll work for the picky eater in your life as well! Feed them off your plate. I think I’ve mentioned this before, but seriously, it doesn’t matter if I give Ryan the exact.same.thing on his own tray, he wants what I have. I try to eat with him as much as possible, so it’s easy for me to just give him a few bites off my plate and put it next to the same item he has. Sometimes that’s all he needs to start eating his own. Other times I switch it up and eat off of his, and then he gets angry and starts eating his own. 😉 The key to toddlers is mind games, people. Find what seasonings work. Ryan loves a lot of seasoning on his food. It took me a while to realize this, but once I did, I found a few combinations and what not that are almost fool proof. Add them to steamed veggies or spice up chicken to add interest as well as a sense of familiarity to something they’re not digging at the moment. Ryan’s favorite combos are chili powder, cumin, paprika, and garlic powder or Italian seasoning, garlic powder, and balsamic vinegar. But don’t limit it to that. Just because you find something they dig, don’t just stay with that. Switch it up to find new combinations they like! Kids’ tastes are ever changing. Plus, you get bored of the same flavors overandoverandover, right? So do your kids. Give distractions a try. It seems counterproductive, but diving Ryan a fork or his water is a great distraction – it gets his mind off avoiding eating and onto something else like actually eating. A lot of the time, both will ‘reignite’ his hunger and get hm eating again when he gets picky or bored. Restrict snacks. We’re working on this one big time over here. I’ve definitely gotten into the habit of giving Ryan a quick snack to appease him or give myself a few moments of peace while I get something done or start dinner. Yes, we try to keep it healthier, but I definitely notice him sometimes picking at a meal and then running over with his snack cup five minutes later expecting raisins. Sorry, kiddo. Not happening. By restricting snacks a bit and creating a reliable and expected “snack schedule” for them, they’re more likely to be hungry when meals roll around and thus more willing to try new things and eat more at meals. Put a new item or picky item on top of a favorite. This may sound weird, but try it out! Ryan will always eat rice. Loves it. So sometimes I’ll put other food on top of the rice. That way, no matter what Ryan has to at least move the top food over to get to the rice. Usually he’ll end up taking a few bites of the top food as well. Try different textures. At some point, Ryan stopped eating broccoli, which I prided myself on it being one of his favorites. It didn’t matter how it was seasoned, he just wasn’t digging it. Then one day I gave him a few pieces that were barely steamed and still kind of crisp, and he gobbled them. Once he decided he wasn’t digging green beans until I roasted them. Try new textures for old favorites, and see if that helps! Eating with a dog optional but encouraged. Eat together. I definitely think if you take one thing out of this, it’s eat with your kids. Eat an early dinner, head out to lunch at weird times, whatever. Obviously, this isn’t always possible because life happens, but as often as possible, eat with them. I’ve noticed SUCH a difference in Ryan’s willingness to sit and eat if I’m eating as well. And if it’s one of those days where you just can’t or you’re not hungry or whatever, at least sit down with them. Don’t give in or give up. God, there have been times where I’ve wanted to just be like, “fine, kid. You win. You want to eat rice, raisins, smoothies and shredded cheese for the rest of your life? Enjoy. At least you’ll be damn happy.” But personally, I don’t think that’s doing any one any favors. Yes, it’s the easy solution in that moment, but in a week, two weeks, a month from now when your kid starts to think of that as the norm, or starts to think that a little tantrum will result in whatever they want, you’ll be regretting it. And they could be missing out on their new favorite food! Also, if you get caught in that trap, there is still hope. I promise! 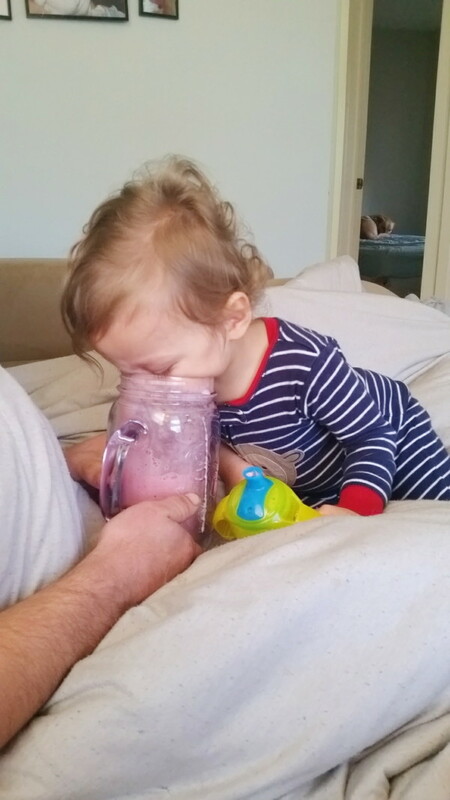 After Ryan was sick, he kept refusing “normal” food in favor of pointing at the blender and begging for all-day smoothies and filling up on snacks. It took a day or two of reminding him that real food was non-negotiable. If all else fails, sneak it in. I’m not the biggest fan of stealthily giving Ryan veggies, but at the same time he’s only 19 months so who am I to say. But adding greens to smoothies (put it into a solid colored cup, if necessary) or purees to pancake batters or other veggies to muffins is a great way to sneak in some extra vitamins! There are a ton of different resources for tips and tricks for this, so if you think this could help you out, I’d start at Google or this cookbook. Obviously, nothing is perfect and we have days where Ryan picks at his meals and throws it all to Cooper. But we also have days where he eats an entire tray of something new and asks for more. 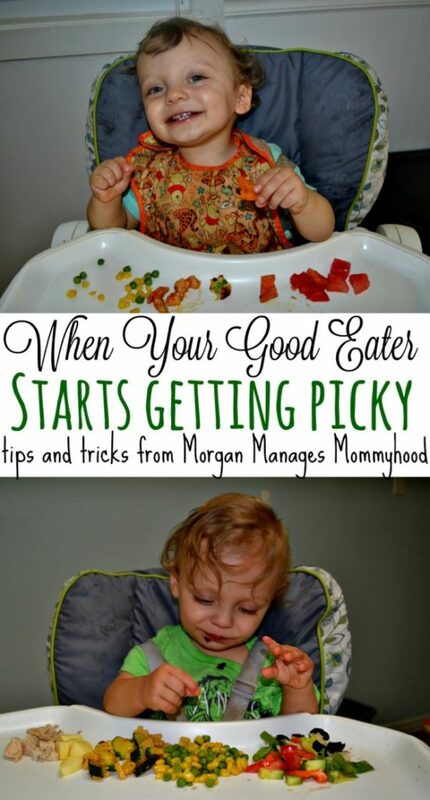 I truly hope that these tips and tricks will help you when your good eater starts getting picky. Be diligent, be open to bending the rules, and be kind and encouraging and we’ll all get over this picky eating hump that is toddlerhood. Good luck! Do you have a picky eater? What are your favorite tips for getting a picky eater to eat? Let me know in the comments! 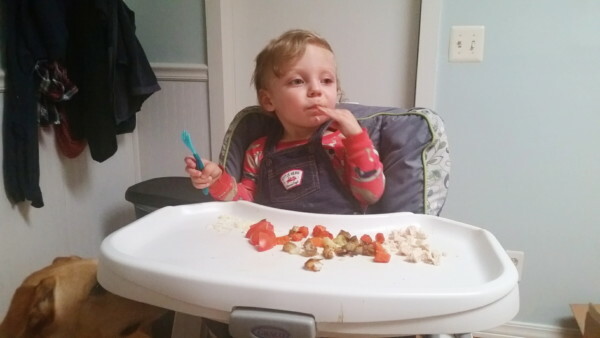 If you’re just starting the road to feeding your baby, check out my Baby Led Weaning series! That’s hilarious! But I’ll be darned if it isn’t true. If my 2 year old refuses to eat the good stuff after a while, I just pull him out of the high chair and try again later. I won’t give him seconds of his favorites if he didn’t eat his green stuff. He hasn’t starved yet, but he is finally starting to eat some veggies. Limiting snacks and eating together definitely helps us! 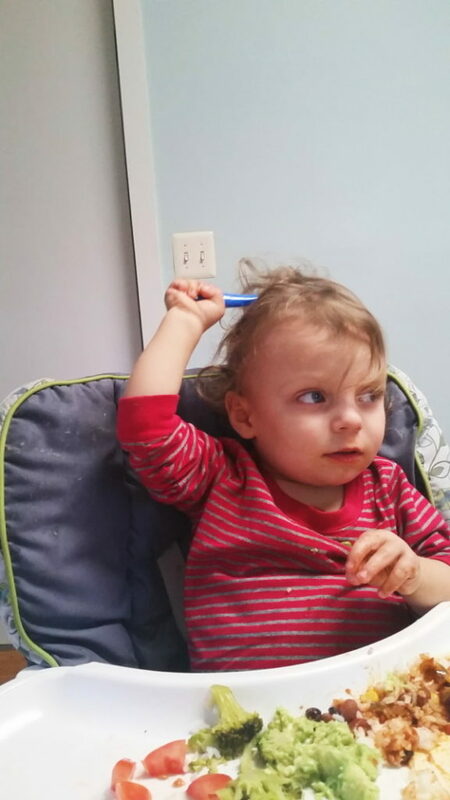 Toddlers are so crazy weird and they decide to be stubborn about the strangest things! Love the tips and thanks for sharing! Seriously, sometimes I just stare at Ryan like, what on Earth goes through your little head daily? I think the number one thing for him is snacks since he really, really loves snacks. hahaha he’ll run over to me, grab my hand, and gently place the snack cup in my hand and stare at me expectantly. Uh, no. Great tips for those picky eaters. Especially the sauces, kids love dipping things! Isn’t it weird how something is 2753538x more desirable to a kiddo is there’s sauce?! That’s such a good rule to have! Thanks for sharing, Emily! When I was nannying, I found one of my most effective strategies when it came to picky eaters was getting creative. Oh man, SUCH a great tip! I can’t wait for my dude to understand a little more so we can do that! When I was little my dad mad eus “mashed potato mountains” with broccoli “trees” and gravy rivers that we thought were the COOLEST ever. Oh man, I totally need to try out those broccoli bites! Thank you! We tried to stick to the no salt etc thing but it’s REALLY hard. Once he hit one, I became a lot more lax about it. Ryan LOVES our leftovers. And seriously, try sauces. Even if you make pasta one night, save a small container of sauce and add some to food for the week. It’s Ryan’s all time favorite! Your little eater is such a cutie! Love all of these tips, thank you for sharing! Thank you! I hope they help you out!! My almost 3 year old is TOUGH. I have tried almost everything on your list and he’s not having it. Removing snacks was a big help for a while! As well as offering the beloved ketchup as dip. But now even foods I know he loves he won’t touch. He’s not starving yet, so I just keep offering things and try not to push it too much. 🙂 Great tips! I swear, toddlers are a FORCE to be reckoned with. It’s insane!! I’m on your level, though. If he’s hungry, he’ll eat it, so as long as he’s gaining weight and growing well, I just keep it going! I can totally relate. For us it seems making sure the things he REALLY likes are limited so he’s still hungry enough to eat everything else. He’d eat his weight in rice or pasta only if given half the chance. So feeding him off our plates isn’t great cause he just wants MY rice if he’s eaten his own. Lol. Finding what your toddler likes seems to help too. And making things look appealing. These are great tips! It is so frustrating when they love something one day and hate it the next. I don’t have that many tricks to make him actually at something but I noticed a new environment helps – kind of like your distraction. 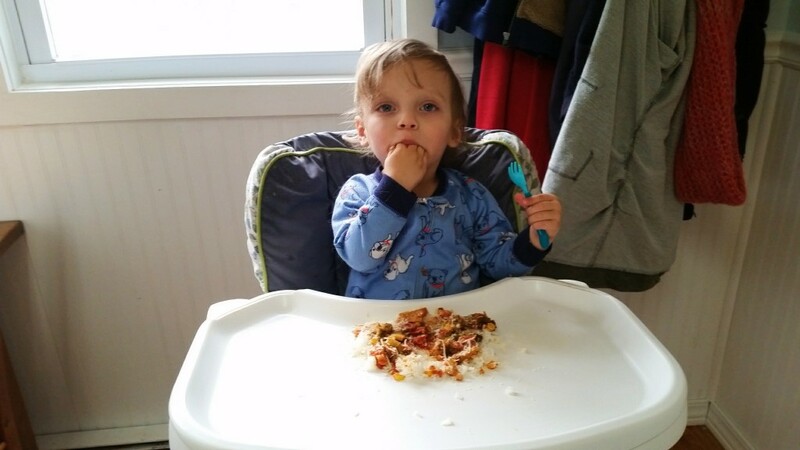 Eat in a different high chair or in a different location in the house. He’s great at eating restaurant food because of the novelty.